Qualitest Weather Ometer use xenon arc lamp as a light source. 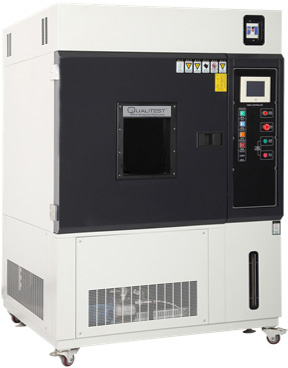 It is an equipment for simulation and strengthening of weathering accelerated aging test. After testing, you can receive the accurate atmospheric aging test results, used to evaluate the weather resistance of the testing material/ samples. The weathering test is an important way to optimize the composition of the product in the process of scientific research and production. It is also an important part of the product quality inspection. Application for testing such as coatings, plastic, aluminum-plastic plate and automobile safety glass are required to do this kind of weather-ability test. The testing material/ product placed in a certain temperature of the light and moisture alternating cycle of the program to test, with a few days or weeks to reproduce the outdoor months or even years of the emergence of the harm/ damage. Artificial accelerated aging test data can help use select new materials/ right product, modify existing materials, and evaluate how the formulation changes affect the durability of the material/ product. Lamps, internal filters, external filters, digital power supply and other core accessories for Qualitest Weather Ometer comply with other well-known brands in Europe or America. Qualitest Weather Ometers are made of high quality components. The real reproduction of outdoor climate, heat, humidity and rainfall and other comprehensive conditions, Make the sample artificial accelerated aging test.